Above: Minnesota Museum of American Art's Curator of Exhibitions Christopher Atkins and former Curatorial Fellow Johnnay Leenay with Leslie Barlow's "Stephen, Jeffrey and Twins" (2017). The Minnesota Museum of American Art, set to reopen Dec. 2, recently acquired Minneapolis artist Leslie Barlow’s painting “Stephen, Jeffrey and Twins” (2017) from the Minnesota State Fair’s Fine Arts Exhibition. Barlow received $4,000 for the painting, well within the museum's $5,000 budget for its annual purchase from the State Fair. Barlow also walked away with two awards from the State Fair: White Bear Center for the Arts Award and the Metropolitan Regional Council Award. 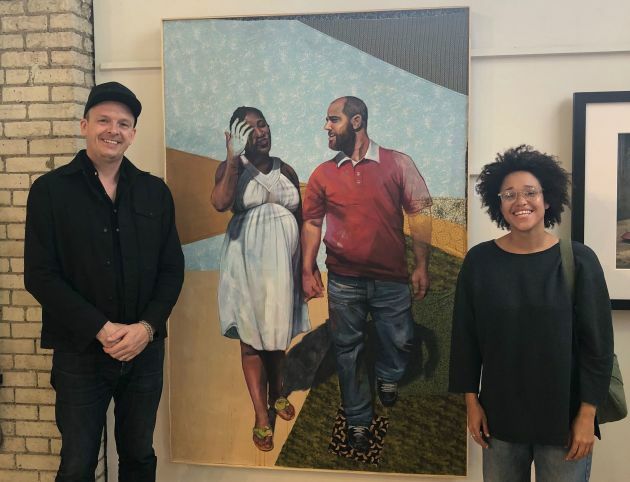 Barlow, who creates realistic paintings of interracial couples, families and friends, is a fixture on the Minneapolis art scene. The painting that the M purchased was featured in her February 2017 solo exhibition “Loving” at Public Functionary. The show was inspired by the 50th anniversary of Loving V. Virginia Supreme Court, which struck down all state laws banning interracial marriage. In addition to having her painting as a part of the permanent collection, Barlow will also be teaching a short painting course at the M’s new Sifo Center for Creativity. Barlow is the eighth Minnesota artist from the State Fair to have her work purchased by the M, a tradition that began in 2011. Last year’s winner was Sam Orosz, a young printmaker who graduated from the University of Minnesota at Duluth, and recently did a residency at Highpoint. “[Purchasing artworks from the state fair] makes sure that our collections reflect the artists who live here, all over the state,” said Atkins. It is not too late to see Barlow’s painting. The piece will be on view in the Fine Art Building through Sept. 3, the last day of the fair. Grab some corn and head over to the annual juried art exhibition!